I love Easy Cinnamon Rolls, it’s all the flavors I love from a Traditional Cinnamon Rolls but made so much easier and faster. It’s a process I picked up from my Sister in Law decades ago and I still use it today. What Makes an Easy Cinnamon Roll Recipe? Easy Cinnamon Rolls are easy because of the process. Instead of rolling up the dough filled with brown sugar and cinnamon you make a quick flat circle topped with brown sugar and cinnamon. 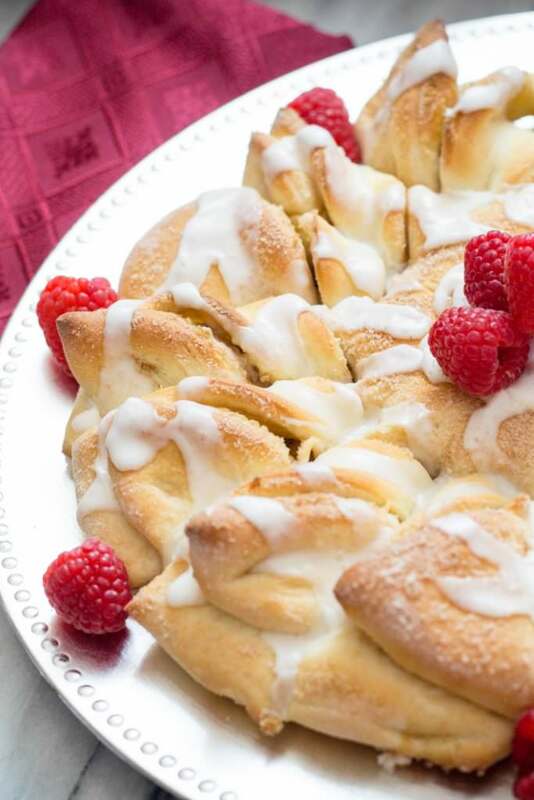 The easy twisting sections make for a beautiful presentation, and are easily cut for enjoying after baking. It’s just easy! Fun Fact! 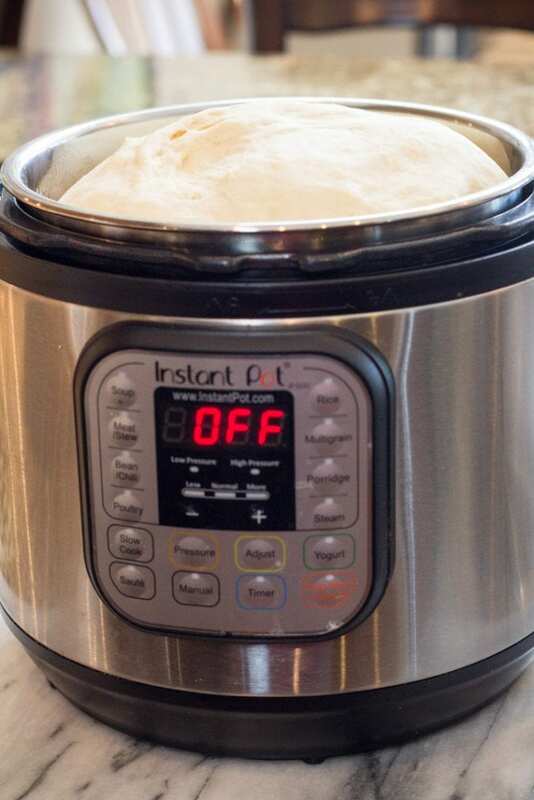 I’ve found that using the “Yogurt” button warms the inside of the Instant Pot to a perfectly warm temperature that speeds up the raising process of bread dough. I’m Serious! 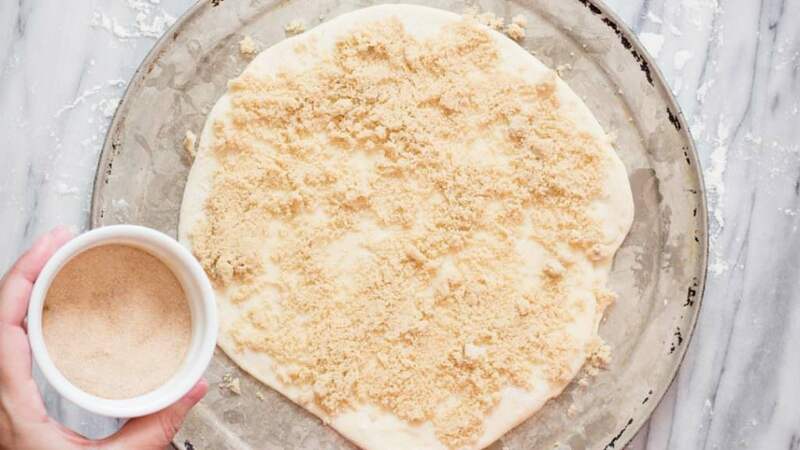 This dough will double in size in half the time a normal recipe states. Amazing Instant Pot Hack and I’m hooked on. When I was young(er) and newly married my Sister in Law happen to make this Easy Cinnamon Roll Recipe. WOW! My mind was blown. It was so quick, fast, and easy to throw together. It wasn’t so much the recipe as it was the process to make the Cinnamon Ring. Over the years I’m made hundreds of these Easy Cinnamon Rolls to deliver to friends and family, mostly for the holidays. Layering 2 pieces of dough with brown sugar, cinnamon and sugar in between makes a great cinnamon ring. And so much easier than rolling dough and cutting it up. These rings are made smaller so they are perfect for a family to enjoy. Now, wouldn’t you enjoy receiving one of these? I know I would! How to Bake Easy Cinnamon Rolls? Baking these Easy Cinnamon Rolls is super simple. I find these cook evenly because of how it’s placed on the pan. Bake at 350 for 10-12 minutes. How to Make Easy Cinnamon Roll Glaze? The perfect glaze for Easy Cinnamon Rolls is 2 cups powdered sugar, 1/4 cup cold butter, 1 tsp vanilla, and 3-4 tbs milk. Cut the butter into the powdered sugar then add the vanilla and mix in the milk. A hand mixer works great to get a smooth texture. Mmmm.. Perfect every time! How to make Easy Cinnamon Roll Recipe from Scratch? Making bread recipes from scratch can be hard, but with the right recipe it becomes easy. 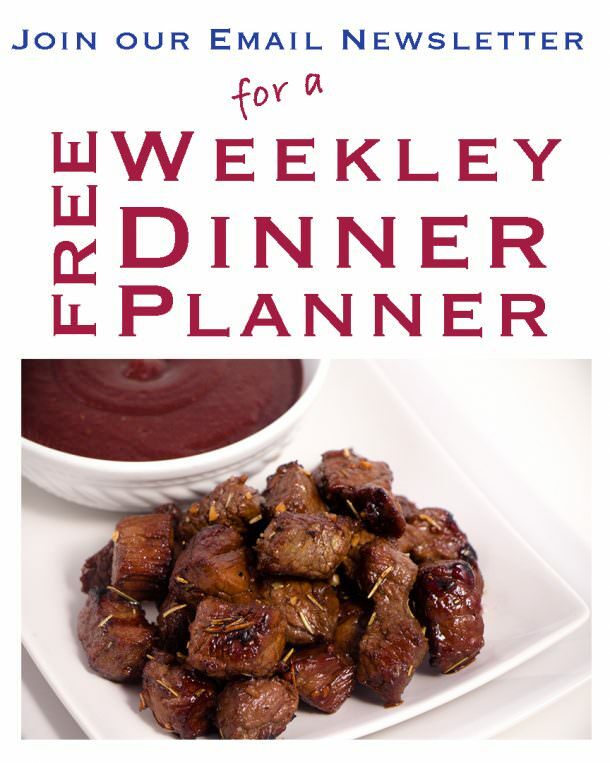 This recipe has been tried and tested over and over and it just works. Follow the recipe, watch the quick video and you will make perfect rolls! I also prefer to use a large stand mixer. I love my Bosch! How to make Easy Cinnamon Rolls Cream Cheese Frosting? Do you love a little cream cheese in your frosting? Me too! Use 2 cups powdered sugar, 1/4 cup cold butter, 3 oz Cream Cheese, 1 tsp vanilla, and 3-4 tbs milk. Cut the butter into the powdered sugar then add the vanilla and mix in the milk and cream cheese. You will have a much thicker frosting with the goodness of cream cheese. 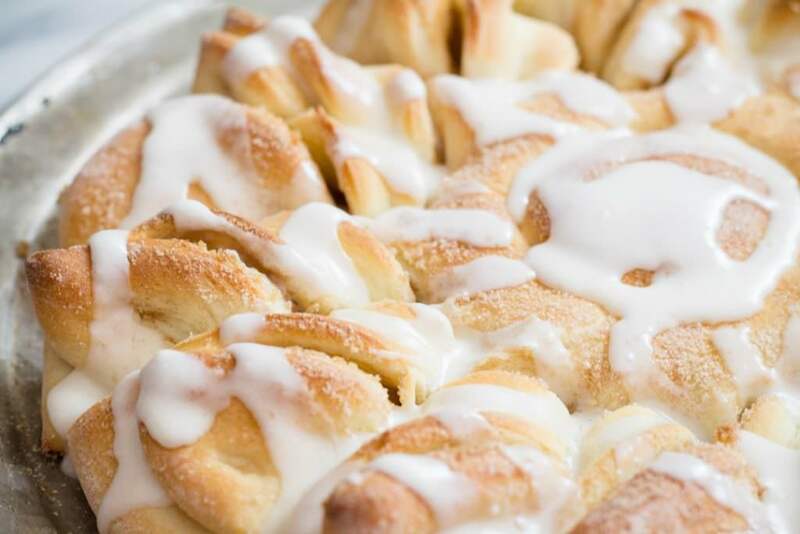 Everyone loves a little bit of glaze or frosting on their cinnamon rolls. We love to combine 2 Cups powdered sugar, 1/4 cup cold butter, 1 tsp vanilla, and 3-4 tsp milk. I like to use a cheese grater to grate the butter into small pieces that easily can be cut into the powdered sugar. So quick and easy. In a large bowl combine warm water, sugar, oil, salt and yeast. Allow to proof for 10 minutes. Then Add yeast mixture to Stand Mixer with 3 cups flour and combined. Adding 3 more cups flour and add eggs one at a time. Then add 3 more cups flour. Add remaining 1 – 1 1/2 cups slowing. Dough should be soft but not sticky. Set dough aside to raise for 20 minutes or see Instant Pot Hack for raising dough. Roll out a small amount of dough into a 10in diameter and cover with brown sugar and cinnamon/sugar mixture. Roll out another small amount of dough in 10in diameter and place on top. Sprinkle with cinnamon and sugar. Cut center circle and cut slices. Twist each slice a full twist and place down on pan. Bake at 350 for 10-12 minutes. 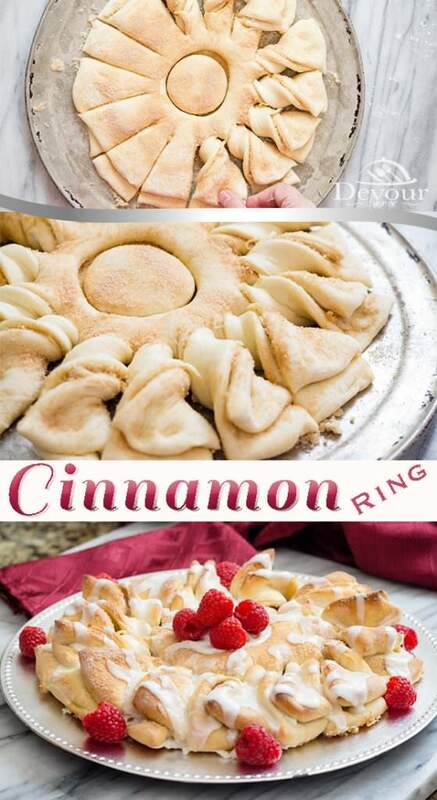 Add glaze or frosting to warm Cinnamon Ring. Garnish with fresh fruit. Serve and enjoy! More Amazing Bread Sweet Bread Recipes! 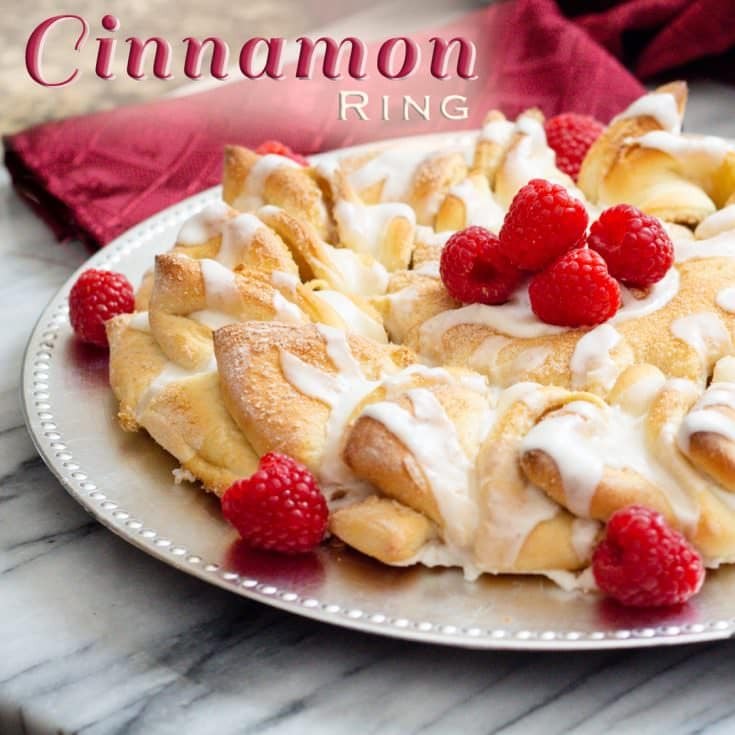 Cinnamon Rolls made into a quick and easy ring. In a large bowl place warm water, sugar, oil, salt and yeast. Gently stir and set aside for 10 minutes to allow yeast to proof. In a large stand mixer add 3 cups flour and pour yeast mixture into flour. And additional 1 to 1 1/2 cups slowly - 1/2 cup at a time and allow to fully incorporate into dough. Dough should be soft but not overly sticky. Take a small portion. About the size of a large fist and roll out to a circle about 10 in diameter. Mix Sugar and Cinnamon and sprinkle half of it over dough. Repeat step 9 and place on top of dough with brown sugar and cinnamon. Using a glass cut a circle in the center of the Cinnamon Roll. Using a Pizza Cutter or sharp knife, cut slits around the circle about 2 inches apart. Do not cut up to the center circle. Leave about 3/4 inch buffer. Take each section and twist a full twist and place down. Instant Pot Hack: Place dough inside of Sprayed Instant Pot and set to "Yogurt" setting for 5-6 minutes. The low heat will speed up the raising process of the dough. 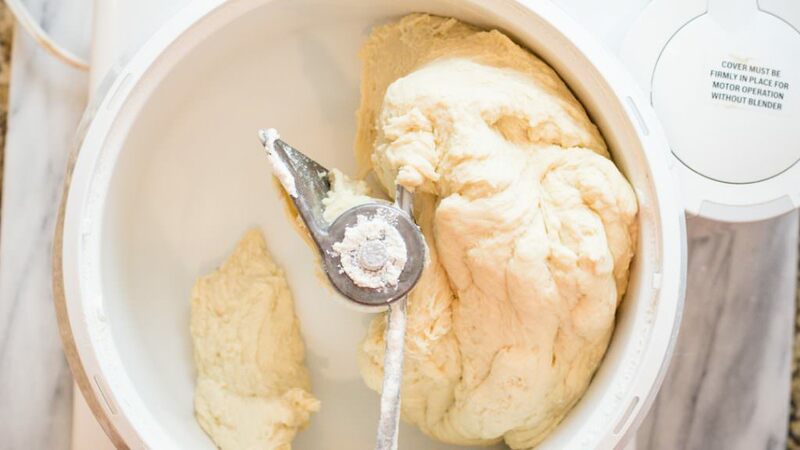 Your dough should double in size and save you time! Glaze: 2 Cups Powdered Sugar, 1/4 Cup Cold Butter, 1 tsp Vanilla, 3-4 Tbs Milk. Cut cold butter into Powdered Sugar and add Vanilla and Milk. Use a hand mixer to combine and drizzle over warm Easy Cinnamon Roll. Traditional Cinnamon Rolls: If you want to make traditional Cinnamon Rolls use 1/2 of the dough and roll out on floured surface. Add brown sugar, white sugar and cinnamon and roll into a log. 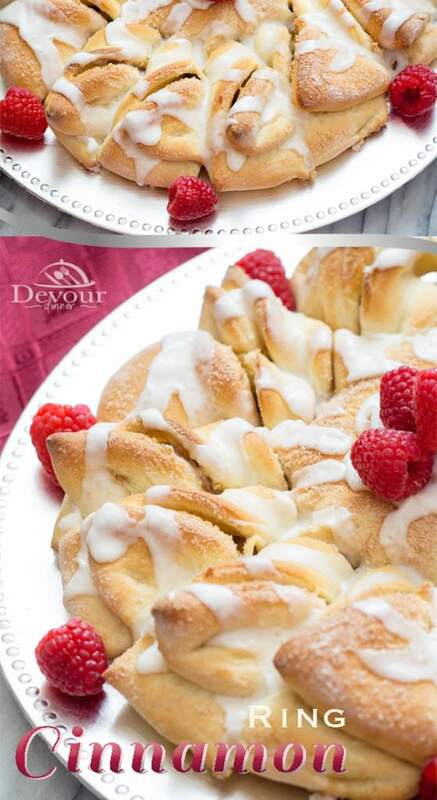 Using a knife or thread cut into Cinnamon Rolls and place on a cookie sheet. Allow rolls to rest for 15 minutes before baking. They will also raise more in this time. Bake at 350 for 12 minutes. Pizza Cutter vs Knife: To cut the ring slices, I like to use a Pizza Cutter and then follow up with a sharp knife to make sure the dough is cut all the way through. The sharp knife is able to cut close but not through to the center circle. 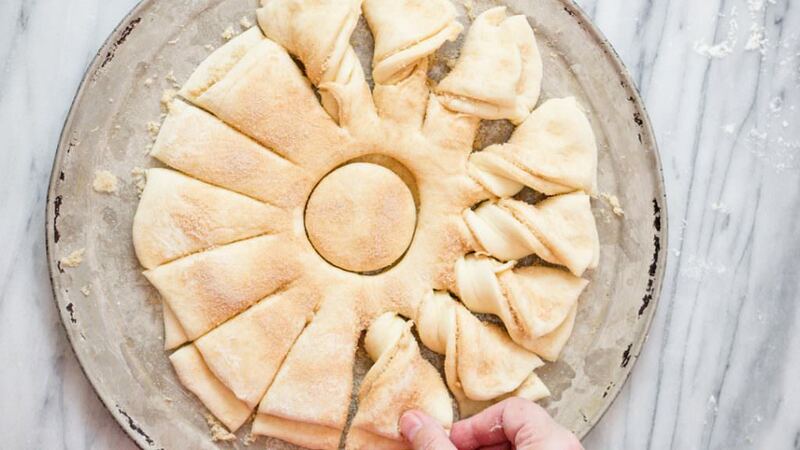 How many sets of rolled circles does this recipe yield? 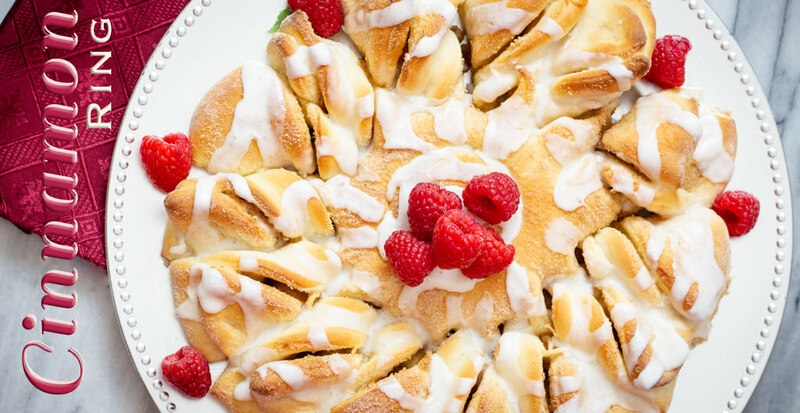 You can make 3 of this Cinnamon Rings with this recipe. Or you can use the dough to make traditional Cinnamon Rolls. Theresa ~ These are so fun and easy. I love making them into a twist.